Students participate in a game of Bubble Soccer in Stambaugh Stadium. 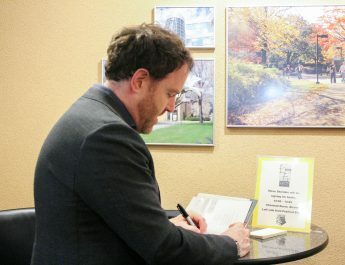 YSU is one of the first schools in Ohio to offer this activity. A soccer ball bursts between a pair of scrambling strikers. As one player dashes to intercept the ball, their efforts are brought to an abrupt stop when an opponent smashes into them head first, sending them violently crashing into the hardwood gym floor. No penalty is called, and no injuries are sustained. The grounded player wobbles to their feet — a giant plastic bubble engulfing the totality of their torso — and returns to the chase. This is no ordinary game of soccer. This is Bubble Soccer. 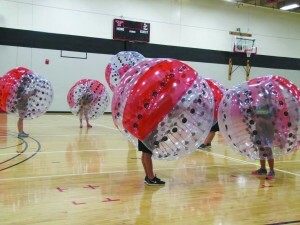 Bubble Soccer is a form of soccer played while running around in oversized bubbles. The objective of the game is the same as soccer, to win by scoring the most goals within four five-minute quarters. However, there aren’t any goalies in this game and time will not be stopped unless there are injuries. Joe Conroy, coordinator of Intramural and Club Sports, was inspired to try the sport at Youngstown State University after seeing the game displayed at a club sports conference. “We look at it as a growing activity and will get more popular across the country as the year goes on … YSU is one of the first schools in Ohio to begin this program,” Conroy said. The first meeting was held Tuesday at the gym inside Stambaugh Stadium. In total, 60 students have signed up. These 60 students have been split into six teams of 10. Dan Schaefer, an intern and overseer of the game, stated that the game is currently not available outside of intramural league play. “We’re sort of in a testing phase with the game right now. We’re at a place where we’re totally in control and can change whatever we need to change about the way the game is played,” Schaefer said. 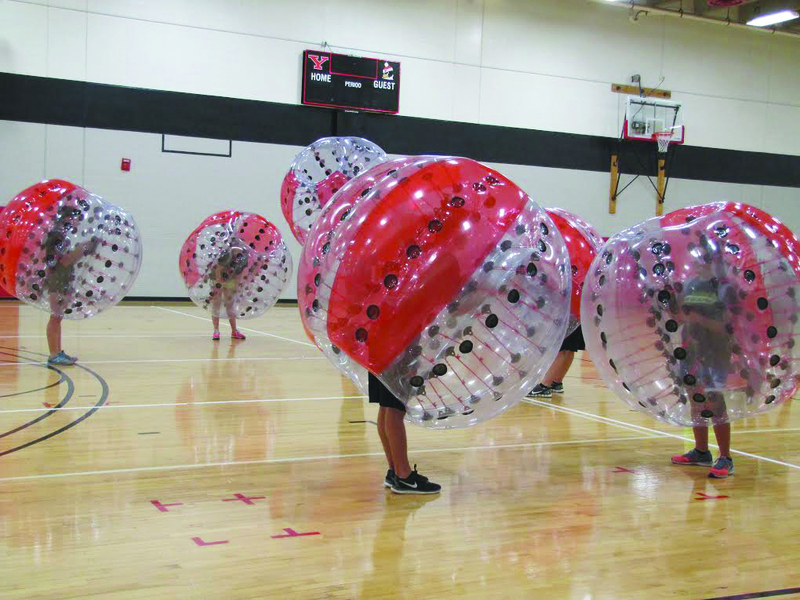 Bubble Soccer was an event introduced during the IGNITE event for incoming freshmen. It was used as an entertaining way for new students to get to know each other and get immediately involved with campus life. Tyler Hovanec, a junior and current player of the game, said that his love for soccer made him want to join the activity. While the game will likely appeal to soccer players, its unusual play style and the humorous, large plastic ball participants wear may also draw students who otherwise might avoid group sports. “The world’s best soccer player could come here and play and not have any distinct advantage because bubble ball isn’t normal soccer … it’s very much its own game,” Schaefer said. The next game will be played Tuesday and will be held in one of the three connected gyms on the second floor of Stambaugh Stadium.